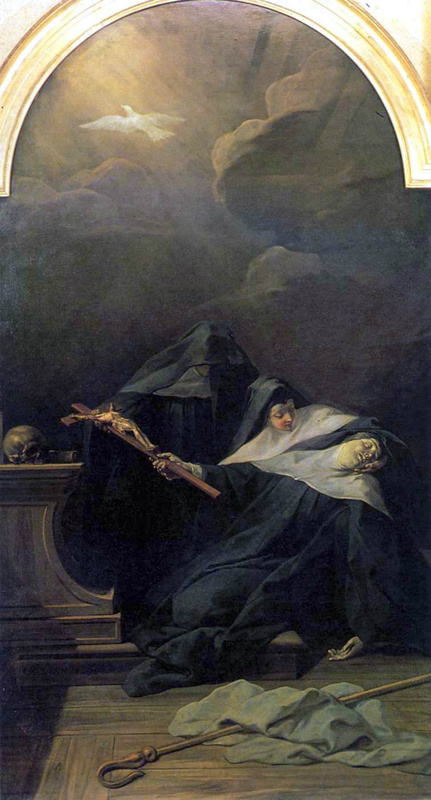 St. Scholastica was the twin sister of St. Benedict of Nursia, who founded the Benedictine order. They were born in Norcia, Italy around 480. From a very early age, both were very devoted to Jesus. When Benedict established his monastery at Monte Cassino, Scholastica founded a convent about five miles south. Although the siblings were quite close, the rules of their houses did not permit either entering the other’s monastery. They met once a year at a house near the Monte Cassino monastery to talk about God and other stuff. Just after his return to the monastery, Benedict saw a vision of Scholastica’s soul departing her body, ascending to heaven in the form of a dove. She died three days after their last meeting. He placed her body in the tomb he had prepared for himself, and arranged for his own to be placed there after his death. She is invoked against storms.